Application: For dewatering and delivery purposes during deflooding, handling for waste water, sewerage and mud at maximum working pressure of 0.7, 1.0 and 1.5 MPa. 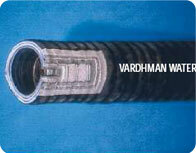 Type: Type 2 - Hose having smooth bore. Lining : Natural/synthetic/blend rubber compound lining for water and abrasion resistance. Reinforcement : Reinforcement of rubber impregnated woven textile applied on bias at approx. 45º angle combination with galvanized steel wire. Cover : Corrugated cloth marked finish outer cover made from natural rubber compound resistance to water, sunlight, UV rays, ozone, abrasion etc. Pressures: W.P. of 0.7 MPa & min. B.P. of 2.1 MPa . W.P. of 1.0 MPa & min. B.P. of 3.0 MPa . W.P. of 1.5 MPa & min. B.P. of 4.5 MPa .